This is such an important subject! We’re proud to feature this guest post from our friend Lana Fraley Rich, Catsultant®, at www.Catsultant.com. Do you know if you have any dental diseases? You may not know for sure, unless you are having regular dental checkups or you are having some kind of discomfort or bleeding. It is not uncommon for people to have asymptomatic dental disease. Many people don’t seek treatment until the problem becomes more advanced and painful. How long would you wait to go to a dentist if you are experiencing pain? How long would you put up with a loose tooth, a cracked tooth or an abscessed tooth? You may be surprised to learn that almost 50% of adults over 30 years old have dental disease; and by age 65, 70% have periodontal disease. Before my current career as a cat behaviorist, I worked as a dental hygienist. I am very grateful to have had those years of dental hygiene experience, because it has made me a better cat behaviorist. I have seen many cat behavior problems caused, in part, in by dental disease. What kind of mood would you be in with an abscessed tooth or two for a couple of years? When we experience pain, we usually show it, or say something and get help. Animals that are experiencing discomfort or pain have been programmed to hide or lay low, so predators or competitors won’t pick up on their pain. This instinct to hide pain remains extremely strong in our domestic cats. So, how do we know when our cats have dental disease? It can be difficult, because they usually suffer in silence. For the most part, our cats often learn to cope with it. Sometimes they seem to be a bit quieter, or be sleeping more than normal. You might notice bad breath, receding gums, drooling, difficulty eating, grumpiness, or behavior changes. If we don’t know what to look for and we don’t realize they are hurting, they have no choice but to live with it. Here is an important statistic from the Cornell University College of Veterinary Medicine: Almost 90% of cats over five years of age have some type of dental problem; and almost 80% of cats in the U.S. have some form of gum disease before they are three years old. Only the top part of each tooth, the crown, is visible during a routine examination. Two-thirds of each tooth is below the gumline and CANNOT be properly examined or evaluated at a routine vet visit. Therefore, any dental disease that might exist beneath the gumline, which could be causing pain and contributing to other conditions, goes undiagnosed and untreated unless dental X-rays and periodontal charting are done. Unfortunately, not all veterinarian clinics have dental X-ray equipment. It’s best if this capability is digital, because it is much faster (reducing the cat’s time under anesthesia) and provides much better resolution. Please inquire about this necessary part of your cat’s exam prior to your appointment. If your vet clinic doesn’t offer this important service, please find one that does. Sadly, some people are told beforehand that their cat’s oral condition “doesn’t look that bad” or “looks OK for her age”, but after the vet does X-rays, it is apparent that wasn’t the case. Without a full dental exam, periodontal probing and a full set of X-rays, this cat might still be suffering a great deal of pain, and still exhibiting some puzzling cat behavior problems. There is another very important reason to keep your cat’s oral health in good shape. We know much more about the oral-systemic connection now. You may have read or heard about the human side of this topic. According to Angie Stone’s book, Dying from Dirty Teeth, and many other sources, there is evidence that certain bacteria residing in our mouth, left untreated, can lead to pneumonia, diabetes, heart disease and a host of other ailments that can result in an early and unnecessary death, especially in the elderly residing in nursing homes. Our feline family members have an oral-systemic connection, too!! If you are lucky enough to enjoy living with a feline family, please plan for the cost of having thorough dental exams and cleanings by no later than their 5th birthdays. If you, or your vet, notice that your cat has bad breath or gingivitis earlier than age five, please check it out ASAP. There are some genetic oral diseases which are very painful and can occur at an early age. 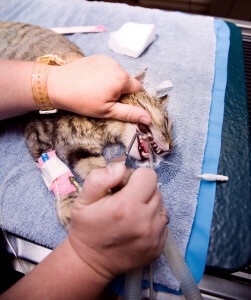 What can you do to prevent dental disease in your cats? The best way to prevent dental disease is to feed your cats a species-appropriate diet, without wheat, corn, soy or by-products. Most cats that are eating a balanced raw food diet have much less dental disease than those eating processed cat foods, even dry cat food. (No matter what the pet food companies say, dry food does not clean the teeth!) The better the diet, the less you have to spend treating dental diseases. Gentle tooth brushing helps too. Toothpaste is not necessary. Toothpaste doesn’t remove the biofilm, the toothbrush does! What is a biofilm? It is the bacterial basis of plaque; and the carbohydrates in food, particularly simple carbs like corn and potato, feed it. When cats eat food that contains undesirable carbohydrates, they have more biofilm. If the biofilm isn’t removed every day (think about why you brush your teeth), it hardens into tartar; and then it must be removed professionally at a dental cleaning. TIP: You might want to consider declining an application of fluoride to your cat’s teeth after cleaning due to potential toxicity. As a holistic dental hygienist, I never used fluoride on my patients’ teeth, nor did I recommend using any toothpaste containing fluoride. As a cat behaviorist, I strongly recommend completely avoiding the use of fluoride with cats, and even avoiding offering tap water to your felines if it contains fluoride. Clean filtered or spring water (but not distilled) is preferred, served in clean non-porous glass or ceramic bowls, of course!